The central philosophy of the Johns Hopkins Division of Rheumatology since its establishment more than 55 years ago is that a critical path to understanding the human rheumatic diseases is the study of large numbers of well-defined human patients, using tools that span the spectrum of investigation, and effectively merge basic laboratory studies with clinical and epidemiological research. In recent years, this strategy has driven the growth of a highly interactive faculty devoted to prediction, diagnosis, prognosis, monitoring, and therapy across the broad spectrum of autoimmune rheumatic diseases. Our approach has been to create Centers of Excellence, which provide an opportunity to evaluate large numbers of patients with similar phenotypes, in the context of a multidisciplinary clinic. The current Centers of Excellence include systemic lupus erythematosus, scleroderma, vasculitis , arthritis, myositis, and Sjogren’s syndrome. The Rheumatic Diseases Research Core center (RDRCC) funded by P30-AR053503 since 2006 led to remarkable growth and productivity in rheumatic disease research at Johns Hopkins by coupling these extraordinarily rich sources of clinical information and biological material to the investigative enterprise. These funds were valuable for the new systems and infrastructure that they provided, but also for other resources that they so effectively leveraged. We were able to grow the user base of the flow cytometer sufficiently to write a successful shared instrumentation grant for a new and sophisticated FACSAria, which required an institutional commitment of additional space, funds for renovation, and a several year commitment of support from the Institution and major users. The increased use of several of the sample processing and assay services necessitated purchasing new equipment to improve throughput –including a Perkin-Elmer Victor3 plate reader, Bioanalyzer, Nanodrop 2000, and additional gel and 2-D gel systems using institutional funds. We were also successful in raising significant philanthropic funds by showing donors the large effects that relatively small amounts of money could achieve when coupled to the exceptional infrastructure that the P30 had spawned. This successful fundraising allowed us to greatly increase the number of pilot projects we could fund that could use these P30 Core resources. The P30 and these pilot funds were particularly helpful to junior investigators, and enabled them to submit successful independent grant proposals using the preliminary data that they generated. The P30 was also essential in providing investigators at distant sites access to the very valuable patient samples collected in the Centers of Excellence. Lastly, the sample collection, core expertise and assays that the P30 made available allowed us to recruit additional outstanding investigators to ask questions about rheumatic diseases that they previously neither had the access, expertise nor resources to pursue. In its renewal in 2010, the RDRCC continues to build on this significant momentum established in the past funding period, by maintaining our research focus on humans with rheumatic diseases, and building upon the successes in organization, structure and management which were achieved. We have modified and sculpted the Center to allow mature components to become independent, and to add expertise and function in some of the areas identified as critical for additional growth and success. 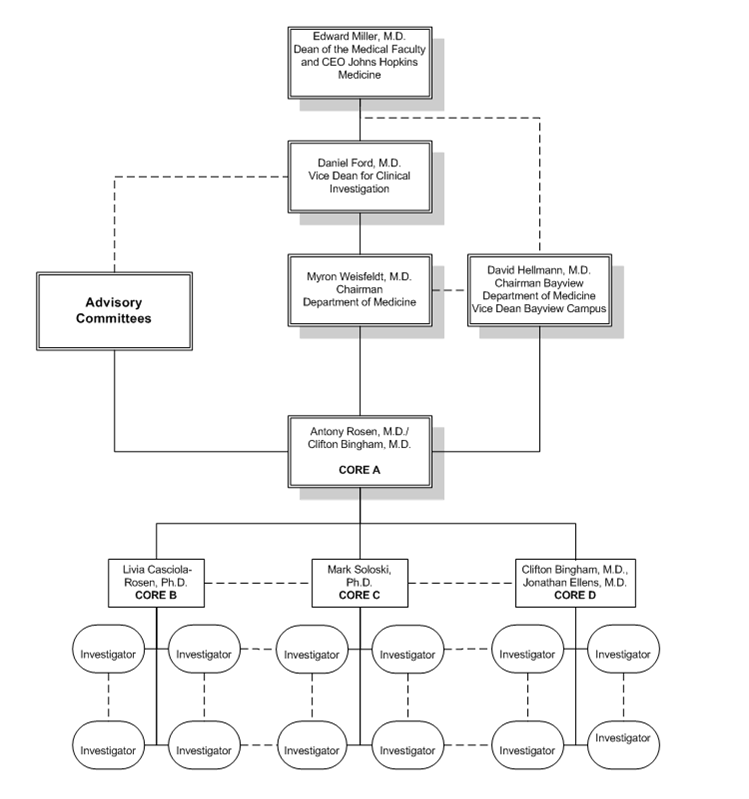 The RDRCC includes an Administrative Core (Core A), and 3 scientific Cores (Cores B-D). Core A provides the ensure integrated functioning of the entire Center, overseeing productivity and managing potential synergies. Core A also coordinates the Executive committee comprising all the Core PIs, which is responsible for real-time management of the Center, ensuring that the quality, timeliness and focus of services are optimal for the research base. An annual meeting of Internal Advisors reviews overall functioning, user satisfaction, troubleshoot specific problems, review measures of success, and evaluate new opportunities. The Administrative Core also oversees the enrichment and Pilot and Feasibility grant program. Core B is the Bioassay Core, which provides sample acquisition, transport, processing, storage and retrieval functions to Core investigators. Core B also provides multiple assay functions, either directly (e.g. autoantibodies, ELISAs, immunohistology), or through easing access to other institutional Core resources. Core C is the Flow Cytometry Core, which provides RDRCC investigators access to state of the art flow cytometry instrumentation and methodology, and develops and provides new flow cytometric approaches that will enhance and expand the research programs of RDRCC investigators. Core D is the Human Subjects Research and Analytical Core, which provide RDRCC investigators access to assistance with database and analytical tasks. Core D also facilitates compliance and adherence to the highest standards of protection of research participants. Dr. Antony Rosen, the Mary Betty Stevens Professor of Medicine and Director of the Rheumatology Division, serves as the Director of the RDRCC. During Dr. Rosen’s tenure, the Division of Rheumatology has grown from 14 to 27 faculty; 9 of 10 junior faculty appointed during this time have been supported by K awards from the NIH. He has a long history of basic and translatational research expertise, directing a major laboratory that has made seminal discoveries in apoptosis and autoantigen generation, and autoantibody development and propagation. Dr. Bingham is Associate Professor of Medicine and Director of the Johns Hopkins Arthritis Center and serves as the Co-Director of the RDRCC. He is a skilled clinical investigator in the Rheumatic diseases, with expertise in clinical trials of investigational therapeutics, outcome measure development, translational research on disease initiation and propagation in RA and OA, and in patient-centered outcomes research. Though Dr. Rosen and Dr. Bingham have largely distinct research skills, they have several ongoing research collaborations, and together they represent the important perspectives of all constituencies of the research base.